This easy to assemble kit will not only keep your toddler occupied, but it also contains snacks in case the menu is not to her liking. 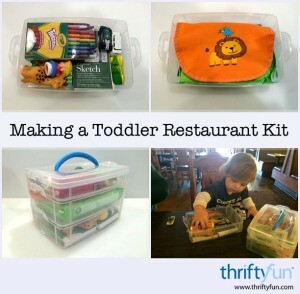 This is a guide about making a toddler restaurant kit. 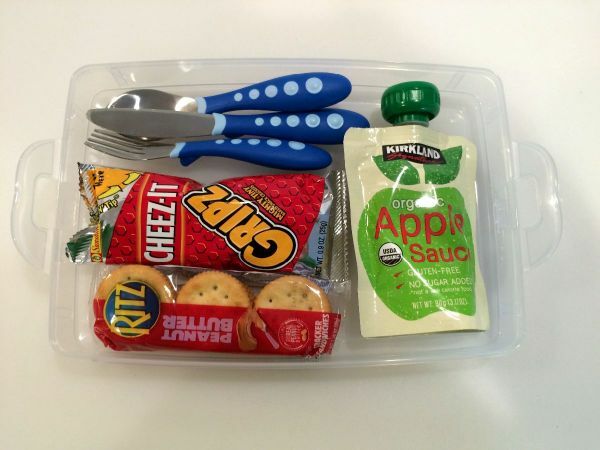 Small Snacks: My son's favorite snacks are crackers and applesauce. Having these items on hand is helpful while we wait for his food, or to tide him over if he doesn't like the menu items, and toddler utensils. 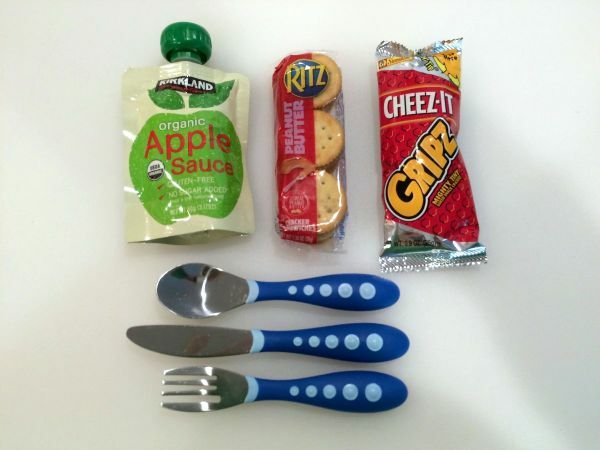 Toddler Utensils: I find that the utensils at restaurants are too big for my son to use so I like to bring his own set. I simply wrap them in a napkin when he is done and wash them at home. Bib: While not necessary, I like to have one on hand for an especially messy meal. 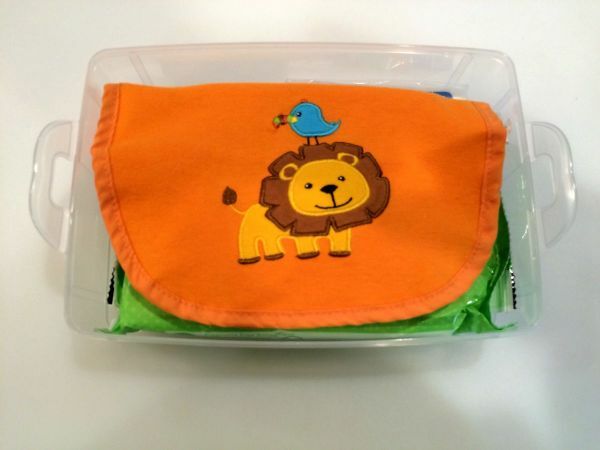 Baby Wipes: Wipes are much better for cleaning up messy little hands than napkins. 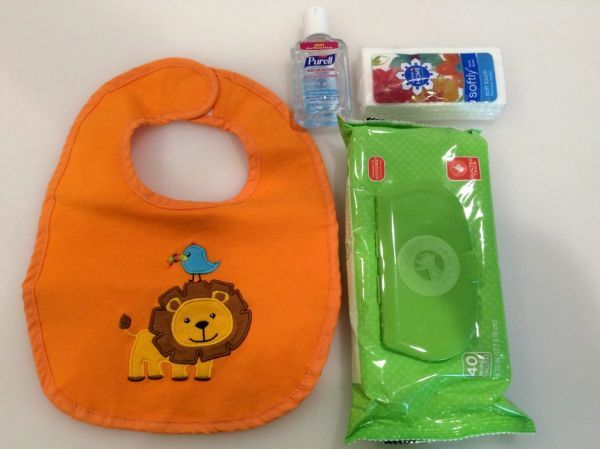 Plus you can never have too many wipes if your little one is still in diapers. Tissues: Runny noses (or even tears) are common with little ones. Having some tissues in the kit makes sure that even my husband has some on hand, since he doesn't have some in a purse like I do. 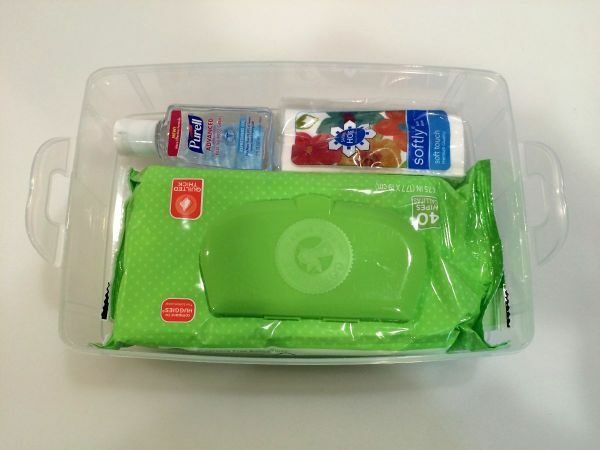 Hand Sanitizer: Hand sanitizer can be handy if a toy falls on the floor or to clean their hands before eating. 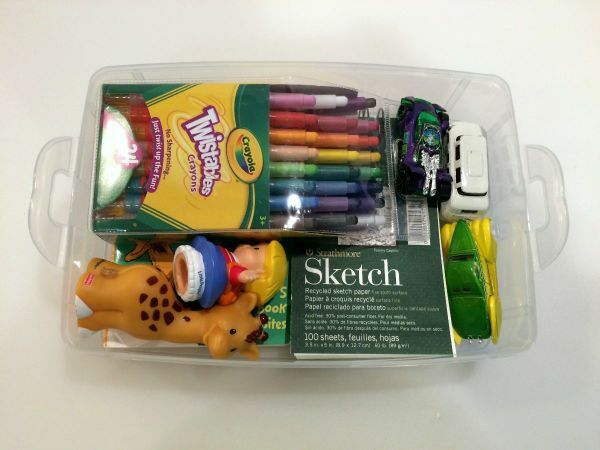 Twistables Crayons: These crayons are great because they are harder to break and don't require a sharpener. Plus now you won't have to deal with the yucky cups of crayons at the restaurant. Sketch Pad: Not all restaurants have a colorable kids' menu so its nice to have some paper on hand just in case. You could always print off some coloring pages too. 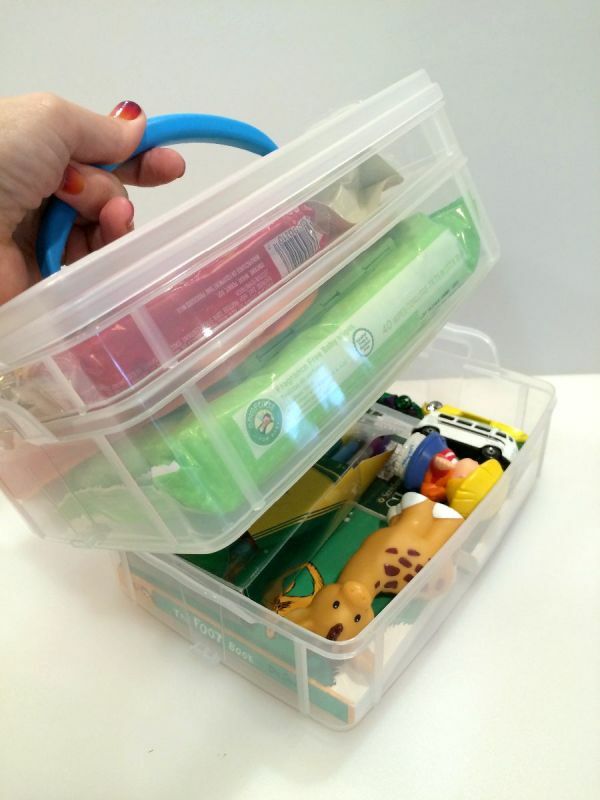 Board Book: There are a lot of small books available that will fit in your kit. Board books are nice because they can be wiped off if they get a little food on them. 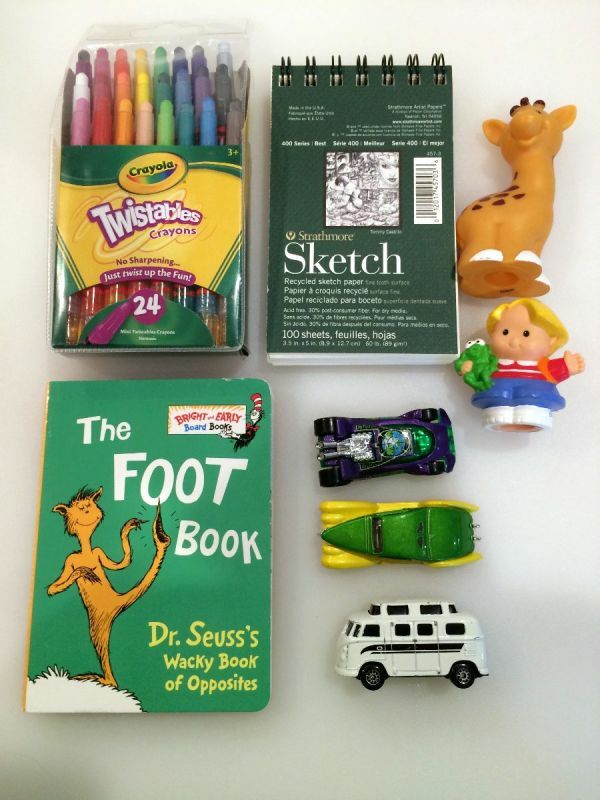 Small Toys and Cars: I chose toys that were easily cleanable and would allow for some imaginative play. Toys with batteries will likely annoy others, so I chose toys that were quiet. All the layers snap together. Just open whatever layer contains what you need. 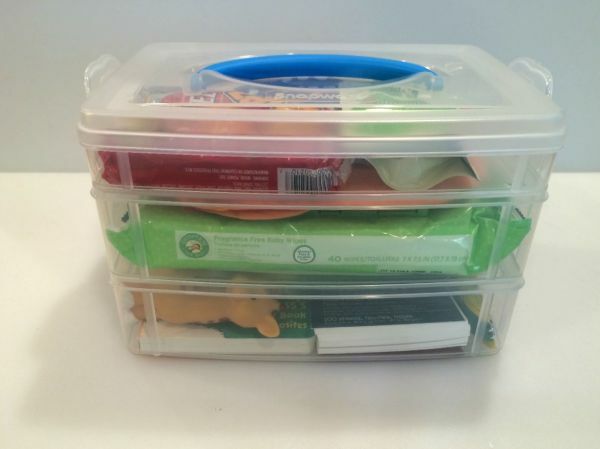 The divided sections also help ensure that books and toys don't accidentally get food on them. Enjoy! 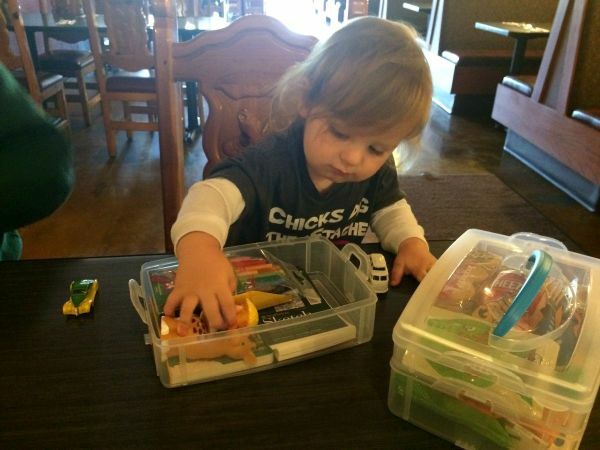 Keeping a toddler distracted at a restaurant is easier with this handy kit. Learn how to make it in this short video.